Get a change to win a Free set meal from Lorenzo’s Way by joining their new promo! 1. Order any of Lorenzo’s Way set meals and take a creative picture of your group enjoying set meals at Lorenzo’s Way in Greenbelt 5 or Bonifacio High Street. 2. To qualify, upload your photo on Lorenzo’s Way Facebook page and share with your Facebook friends. 3. 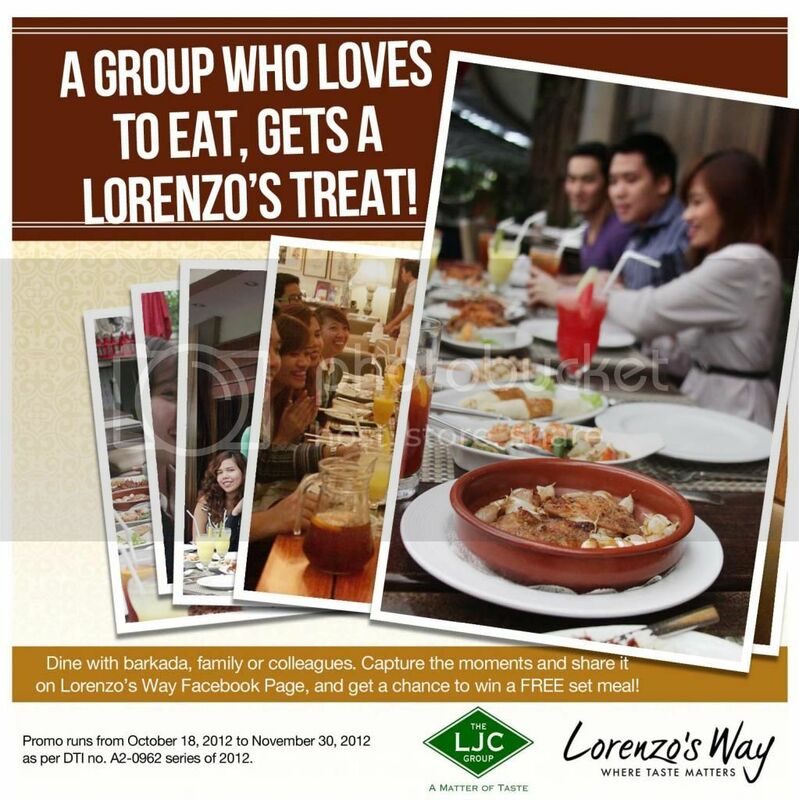 Winning photo gets a free set meal for four at Lorenzo’s Way worth P2,500. 4. Consolation prize of a free Spanish Garlic Chicken dish valued at PHP 365 will be given to the second and third winners. 5. Criteria for judging photos: 50% for creativity and 50% for total number of likes. 6. Uploading and Liking of photos is only until 12mn of Nov. 30, 2012. Uploading and liking done after said time and date will not be honored. Lorenzo’s Way will announce the end of uploading and liking of photo and will take the print screen of every entry that came in until 12mn of Nov. 30, 2012 into an album from which winners will be chosen in the presence of a DTI representative on Dec. 4, 2012 at 6 pm at Lorenzo’s Way Greenbelt 5. 7. Lorenzo’s Way Facebook will announce winners on Facebook on Dec. 6, 2012 and send a personal message to the Facebook page of winners. Vouchers will be sent as an attachment to the personal message. 8. Winners should print out the voucher and present to Lorenzo’s Way before ordering, together with a valid ID. 9. Employees of LJC and participating outlets including their relatives up to second degree of consanguinity or affinity are disqualified from joining the promo. 10. Promo runs from Oct. 18 to Nov. 30, 2012 as per DTI no. A2-0962 series of 2012. What are you waiting for? Join na!